While the natural order of things dictates that children should outlive their parents, the loss of a parent is still one of the most devastating experiences in many people's lives. As parents age and their health becomes fragile, grown children often begin taking on the roles of caretakers, contrary to what was likely the case in previous years. The diagnosis of a terminal illness frequently causes dramatic increases in the care that parents need, and the parent/child relationship may become completely reversed, with parents dependent on their children for their daily care. As they age, it is perfectly normal for parents to develop at least some dependency on their grown children, but this loss of independence can be quite difficult for people who have taken care of their own needs for many years. When the diagnosis of a terminal illness makes it clear that the end is nearing, both generations are sure to struggle with difficult emotions, but it is important that grown children do all that they can to respect the hierarchy, helping their parents with their needs while allowing the older generation to maintain their decision-making capabilities. Terminally ill parents should remain in charge of their care as long as is possible, and grown children can help assure their parents that if they become unable to make decisions for themselves, the children will honour the terms of their ADRTs or living wills. While it can be difficult to talk about such things, making their wishes clear can help the terminally ill to find peace and acceptance. It is not uncommon for middle-aged people to find themselves responsible for the care of two generations - their parents may need them during the same years that they are raising their own children. Add to this the fact that most members of "the sandwich generation" maintain at least part-time jobs and you have a recipe for overwhelming stress. Grown children typically want to do all that they can to help their parents, especially those who are considered to be terminal, but in doing so, most have to rearrange their already busy schedules. If possible, siblings should try to share the responsibilities associated with their parents' daily care, with each taking shifts in caregiving so that all can find a balance between managing their parents' needs and those of their own families. Sometimes, geographical distances make it difficult or impossible for some to provide hands-on help, but unless extenuating circumstances prohibit it, all the kids should try to shoulder some of the responsibilities, rather than resting all of the burden onto one. Even the most dedicated caregivers need some time away from their responsibilities to rest, socialise, and focus on other areas of their lives. Respite care can provide temporary or occasional substitute care, enabling grown children to have a bit of time away from the demands of caring for their terminally ill parents. Professional respite caregivers are available for all aspects of caretaking and can be beneficial for those needing only minimal assistance and companionship as well as patients who are medically fragile. 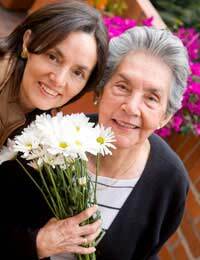 Elder care, when performed by well trained professionals, can help families attend to other obligations while giving them the peace of mind that comes from knowing that their parents are in good hands. While all of life is precious, the last weeks and months often take on special significance. Grown children can help to make their parents' final days as peaceful as possible by finding out their preferences in advance. Many people express the desire to die at home, surrounded by loved ones, while others may envision a different ending. The specifics matter less than the fact that parents' wishes are honoured and that their children do all they can to leave no unfinished business. Expressing love and appreciation for all that their parents have done and given through the years will make both generations feel a sense of closure - and leave the children without regret that they failed to share their feelings when they had the chance.